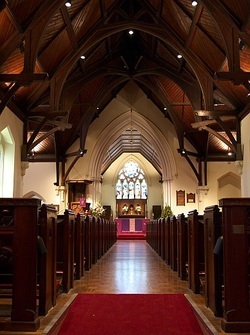 Holy Trinity Anglican Church is one of the parishes of the Diocese of Melbourne in the Anglican Church of Australia. Services of worship began in this building in March, 1863. The Vicarage was built in 1873, and both carry National Heritage classifications. The church contains many splendid stained glass windows dating from the 19th century. The Anglican church worldwide originated in the Church of England and is now a communion of 38 provinces with over 80 million members. The Anglican church is both catholic and reformed. Holy Trinity Kew is catholic because we base our teaching and preaching on the early christian creeds and because we give a central place to the dominical sacraments of baptism and the eucharist, ordained by Christ; and because our bishops trace their authority directly from Christ’s apostles. Holy Trinity Kew is reformed because we believe that all essential teachings must be and can be established by the authority of Holy Scripture. Though we embrace and value the traditions of the church, the Bible is the ultimate authority for Anglican teaching and preaching, and it has a prominent place in our worship. Our worship gives prominence to the sacraments, especially the eucharist, also known as the mass or holy communion. Following Christ’s commandment on the night before his death, we consecrate bread and wine to become his body and blood. In doing this we unite ourselves to his sacrifice on the cross and to our fellow Christians, who give continuing existence to the body of Christ in our world. Our style of worship seeks to fulfil the command of the Psalm 96: ‘O worship the Lord in the beauty of holiness’, through a fine musical tradition, a robed choir, colourful vestments and a beautifully designed and adorned church. The beauty is dedicated to the glory of God; it is not an end in itself. Many of our services are quite simple, but no less devout in spirit and include extensive and comprehensive readings from the Bible. Holy Trinity Kew reveres the fact that God chose to be born as a human being. On the evidence of that act, we believe that God’s love is directed towards every human being, without exception. We welcome to our worship and into our parish community, without judgement, everyone who wishes to join us. Our inclusiveness and acceptance is another way of showing the ideal of catholic and reformed teaching: we aim to be a church for all people that teaches by example an orthodox Christian faith.